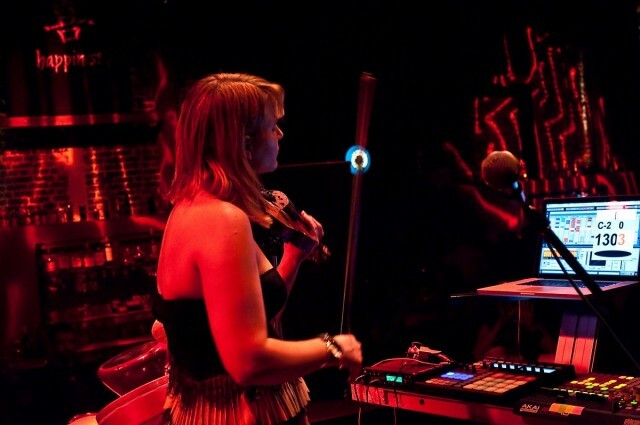 She’s a composer, a sound designer, a performer, and a violinist; she’s recognized as an expert in Ableton Live and has worked with artists ranging from Cirque du Soleil to Kanye West. But now we really get to hear Laura Escudé’s musical vision as a complete picture in her debut album this year, Pororoca. That seemed the perfect time to talk to Laura about her work, particularly as it lies at the intersection of vectors in sound, visuals, and technology that matter so much to so many of us. Laura shares where she sees the music scene going, her own evolution in finding her sound and performance style, and what still lies ahead, and proves – as expected – a fantastic resource for thinking about issues artistic and technological. CDM: Particularly on the synthesis side, it seems your work comes from a really unique timbral world, all these sort of shimmering, sharply-defined pads. Can you talk about your process in sound design? How do you assemble your palette? Spectrasonics Omnisphere, Rob Papen’s entire suite of synths, Native Instruments stuff like Massive and Reaktor, Propellerhead Reason, Logic’s Sculpture and I’ve really been getting into u-he’s Zebra recently. Since my musical work spans a few different genres (electronic, classical, film), depending on the type of project I’ll reach for different elements. My main trick is to dial in certain sounds and then layer the elements from different instruments to create something more interesting, to get those “can’t quite place them” sounds. 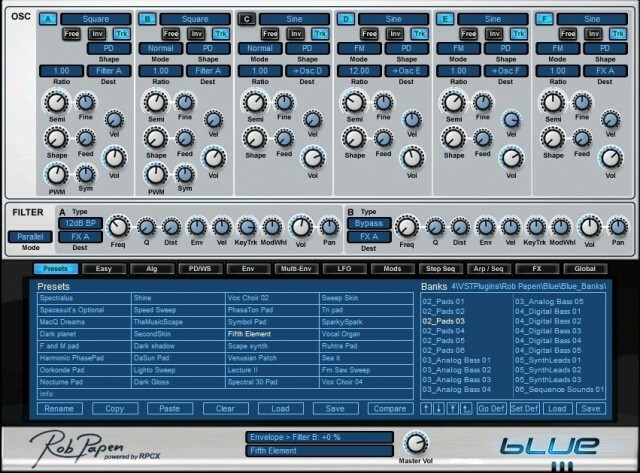 Rob Papen’s Blue synth is a favorite sound source. Screenshot courtesy the developer. The synth that I probably used the most for the types of pads that you’re asking about is Rob Papen’s Blue synth. I feel that Blue is often overlooked since Predator and Albino are so popular, but I really love the warm, cinematic quality of the instrument. The fact that it has both FM and Subtractive synthesis capabilities allows more options when I’m designing a sound. I definitely think my background has impacted my sound design. Typically, I’ll start with a riff on my violin and gradually revise my improvisation into something more refined, then try to match the tone and timbre of the violin with these other types of “hybrid-organic” sounds. I don’t have an exact process for matching the timbres, it’s more of a trial and error type of thing I suppose, but the addition of organic sampled instruments help to make the sounds blend better. I like to combine both samples from my instruments along with other sampled sounds and synths to create a dichotomy of organic and digital sound. I’ve created some instruments in Ableton Live’s Sampler instrument and also some EXS instruments via Redmatica’s Keymap out of various violin, cello and found sounds played in various ways—bowed, struck, broken, with other objects, etc. I pair the recordings of my instruments with the synths I mentioned above to create a more unique sound. These days I’m often creating in Ableton Live at the start, so I’ll create various instrument racks to layer these sounds and mix the levels of each sound against the other inside the racks….with copious amounts of [AudioEase] Altiverb [convolution reverb]. How do you approach blending these instruments with those electronic worlds? In recording? Mixing? Apart from the sound design, I just love the sound of strings by themselves, so I definitely try to get the best recording of my instruments as possible before mixing. On the album, most of the strings were recorded with fairly expensive microphones that I rented from a fabulous place in LA called Audio Rents. I discovered that ribbon microphones are the way to go to help rid some of the annoying high end and scratchy sounds that can cut through with strings. I recorded with the classic RCA 44, Coles 4038 and Royer R-121, all through Neve 1073 preamps. Having a high-quality recording of my string parts makes it a lot easier to mix with the electronic elements. I found that I didn’t have to tweak the EQ as much as I might have with a lesser quality of equipment or different style microphone. I mostly mix everything in Logic and get it to a point where I’m fairly satisfied with the sound and then take it to another studio where I can use more powerful gear to get a more polished sound. Henry Strange of course mixed the album, and I know as a solo artist myself just how important it is to have that extra pair of ears. How do the two of you work together; what was the collaboration like? And how did you bring him in on additional programming; what impact did that have on the sound? Henry and I have been friends and collaborators for a while now. We met in Florida in 2003 right after I graduated from school. My best friend met him at a party and told him that I was super nerdy and all I did was sit at home and make music. She and I had somehow ended up playing music at George Clinton’s studio in college. I fell in love with producing there and I ended up using Acid Pro to create really basic music in my bedroom. When I met Henry he kinda laughed at my music and introduced me to Reason. We started working on music and in 2004 I contributed violin and programming to his album “Human” under the name Trace Element. He definitely inspired me to keep learning and not give up. Fast forward to 2009 — when I finally came close to finishing my album, I hired Henry to help me. A lot of musicians/artists are perfectionists and I am no exception. I probably would have kept tweaking things forever! I really needed another pair of ears to tell me what worked and what needed work…and Henry certainly is honest about what he does and doesn’t like. Hiring him really helped to give myself a deadline to finish the project, which I’ve discovered is really the best way to finish anything. I had put each song into a Logic session and we mixed the album at his studio “Strangelab” in Los Angeles. Most of the songs stayed as they were and we just mixed them, but Henry listened to a couple of them that I was a little stuck on and contributed some of his programming skills. The large swell in the middle of Pororoca definitely was augmented by his sound design skills and now that’s one of my favorite parts of the song. I’m really grateful to have worked with him on the album. We have also worked together on other projects, I brought him in to work on Kanye West’s tour in 2009 when I went on tour with the world music band Niyaz and recently he brought me in to sub for him on Drake’s tour. On all occasions, we were programming the music in Ableton Live and setting up custom controllers. 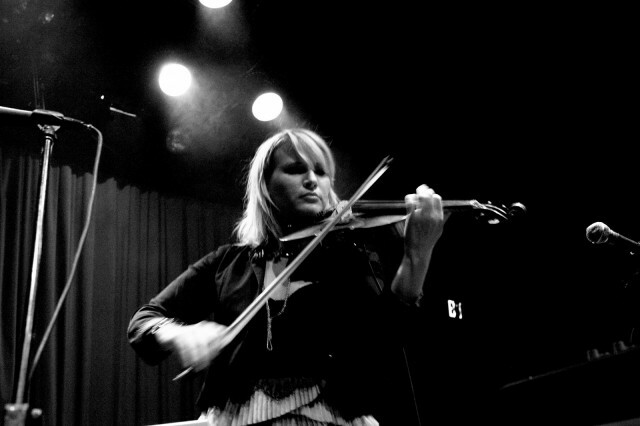 Laura Escudé Live Violin Looping/Lux Aeterna Remix at Dubspot LA Showcase from Laura Escudé on Vimeo. You’re of course well-known as an Ableton Live user. How does Live figure into your production process? How is that different from working live (with a lowercase “L”)? Yes, I keep hearing about this “Ableton Live” 😉 I first started using Live in 2005 when I was working in Tech Support at M-Audio. We were getting phone calls about this “Ablatron” program that was bundled with the gear and were forced to learn it. Once I finally understood the “Excel Spreadsheet” aka “Session View,” I fell in love. Later, I ended up working as Ableton’s West Coast Product Specialist and then becoming a Certified Trainer. Originally, I was just using it for live performance but when I started working for Ableton in 2007 I really embraced it as my production platform, as well. The way that I produce in Live is similar to the way that I perform. I’ll come up with clips of audio and MIDI in the Session View and combine them in various sequences to find some sort of structure, then I’ll jam on the parts as I’ve laid them out into Scenes and record my jam into the Arrangement View. Performing live, I’ll also record my jam into the Arrangement View to bounce to my Soundcloud account or to view changes that I would like to make in my set. Recently I experimented with remixing a song after the fact for a live video, which is a great trick. Generally, I’ll start most everything in Live, using Reason a bit and finishing in Logic. I love to layer the Logic instruments and their in-the-box effects are great for mixing. I created a five-part video series on making Pororoca for Dubspot, which gives a bit more insight into this process. How much live modulation do you do in performance? It seems a really big part of this is allowing some of the music to be backing track, so that you can put your playing in the foreground – after all, triggering clips can’t quite compete with actually playing the violin. But how do you put the two together? My most current set goes through a couple of vibes where I’m trying to show off different aspects of my musicality and explore various ranges of emotion and feeling. I’ll start with just my violin and my foot controller, the Pok. I have three Loopers set up in Live with a bunch of different effects hard-mapped to my [Akai] APC40 [controller]. I record different layers into the Loopers and then manipulate the sounds with effects, dummy clips, and sidechaining. I’ll typically loop violin-centric ambient stuff for 10-15 minutes. Then I’ll move into some of the songs from my album, the more cinematic pieces where I generally play the music true to the album format and play violin over the music, looping it at times and tweaking the sound with different effects via the knobs on my APC40. I definitely have found that it’s difficult to play violin while still creating a cohesive musical track that flows through different pieces of a structure, but I am constantly refining the more improvisational part of what I do. I’ve been exploring using dummy clips in Live to automate some of the violin looping for certain songs so that I can be more free to improvise with the clips and effects. Laura Escudé Live at The Do Lab Presents Bluetech & Emancipator from Laura Escudé on Vimeo. On the album, you bring in a number of other artists; I’m particularly interested in how vocals worked, but can you talk about these folks and how you came to work together? I did some vocals myself on “Birds Are Electric”….I’m incorporating my vocals on the next album and secretly (shhh!) am working toward singing in my live shows. Kathie Talbot—who I’ve worked with for years and is a great friend—did the vocals on the title track “Pororoca”. I brought over the song to her studio and she laid down a few ideas very quickly—she’s a fantastic musician and composer. I used Melodyne to add some other chord layers to her vocals so that it sounded choir-like. Elise Zotos aka Eluv is another fantastic vocalist, musician and friend who sang on “Truest Form.” We actually recorded the song an embarrassingly (for me!) long time ago and I recently added the effects to her voice to make it sound more synthetic when we mixed it in Logic. Eluv, Henry and I all were in a band together in Florida, and you can hear her vocals all over the Trace Element album. This is, for lack of a better way to put it, a dramatic album, one that does have a cinematic quality to it. Electronic music is now open to so many directions, from experimental sounds to real dance music; can you describe where your own motivation comes from, how you came to this narrative? I started playing classical music at age 6 and always had an affinity for film music. When I was 16, I won a scholarship to the Interlochen Center for the Arts camp and was exposed to and performed music like Holst’s “The Planets,” which I loved, being a Star Wars fan. Ed. : Suffice to say, composer John Williams cribbed generously from Holst in his score. In college, I started going to raves and listening to electronic music, then performing violin on electronica records, then finally writing my own hybrid of classical/cinematic/electronic music. As a violinist, I’m very driven by rhythm, but melody is what really gets me to feel something, evokes certain emotions. Pororoca is very melodic, and I wanted to take the listener through a journey of various incarnations of my love for the marriage of these styles. As an artist, I am inspired a lot by my own life and my relationships with others; I think everyone is. A lot of these songs were written at a certain time where I was feeling rather dramatic, perhaps even a longing—yet hopeful and at all times in search for love in every encounter and moment—whether romantic or not. I feel like my music expresses these kinds of emotions for me. Also, I wouldn’t mind licensing them for film and television. I’m working on that now. cutting-edge visual interpretations of your tracks. Through your eyes as the musical creator, what’s it like seeing these renderings? How do you communicate with one another – does he just take these tracks and come back with visuals, or is there some give and play between your aesthetics and visions? And I imagine some of his work must stick with you as you’re doing production – what do you see when assembling tracks? I feel extremely honored to work with Scott, especially since he is so busy with his own ingenious projects. I’ve gotten rather spoiled working with him! Seeing my music accompanied by his visuals for the first time was really a euphoric experience. I had worked with other visual artists in the past, but this was the first time that I had seen really intentional art incorporating my music. We first worked on an audiovisual show last year for HATCH in Asheville, NC. This was the first time that I had seen my music synced to picture (rather than just played alongside). Scott took MIDI from my set as well as audio from my violin to manipulate images in real-time in [interactive visual tool] Touch Designer. I gave him a bunch of tunes and he used all of his own images that he felt represented the emotion of my music. We’ve done something similar for other live performances. His aesthetic and vision are so unbelievably refined and elegant—I always feel like he chooses the right images to tell the story of my music. I don’t say very much other than try to explain how my mind has been blown. For the Pororoca video and album art, I had a loose concept that I discussed with him and he took my ideas and made amazing pieces of art out of it. He sent me some ideas over the course of creating it and of course I loved everything. It’s easy when you’re working with someone of Scott’s caliber. I definitely find inspiration by looking at and watching his work and am more inspired by geometric shapes and dark mechanical images nowadays. Shifting gears, you’ve been an entrepreneur with Electronic Creatives. What is that initiative’s goals, where’s it at, and where is it going? For a while in 2008-2009 I was operating a rep firm called EvoTech Audio, working with companies like Rob Papen, FXpansion, Moog Music. After becoming an Ableton Certified Trainer in 2008, I started to get more work from artists, bands and companies that wanted to hire me for my musical and technical abilities, like Niyaz and Cirque du Soleil. I decided to focus more on music and technology consulting centered around Ableton Live and started Electronic Creatives, which is now an Ableton Certified Training Center. Through my desire to collaborate and work with several different friends and badasses like Henry Strange, Timo Preece, Matt Moldover and Brian Trifon, I started EC’s Ableton Live Master Class series in 2009. We’ve put on several successful events in Los Angeles and San Francisco in the past year, sharing our production and live performance techniques to curious individuals looking to up their musical game. This year, I’ve worked with a whole bunch of different artists and companies, configuring custom Ableton Live sets and controllers for musical tours, shows and theater performances, touring and performing with bands both on violin and Ableton Live, producing artist albums and helping others achieve their musical and technical goals. As this DIY movement has grown, I have seen more people wanting to know how tools like Ableton Live can change the way they approach music making and live performance. I’ve been fortunate to work with people/companies like J.J. Abrams (Lost, Star Trek), Jason Reitman (Up in the Air), Cirque du Soleil (Viva Elvis), Niyaz (Six Degrees), Drake (via Henry Strange), Sean Beavan (Nine Inch Nails) and a bunch of other cool talents! I’ve been chronicling some of my music technology adventures on EC’s blog. In 2011 and beyond, my dream is for Electronic Creatives to become known as the premier music and technology consulting firm and assemble a team of people to help me work on productions and in studios all over the world….all the while continuing to perform and write music for my own projects. It does represent a change from where the music business was: we’re now not just talking about selling albums (if, indeed, we are at all), so much as seeing music as a kind of service, yes? And what does it mean for music as people do start businesses that share knowledge as much as they do privilege musical objects? Things have definitely been changing in the musical world. Gone are the days of massive, expensive studios and now the tools are available to almost anyone. I think it’s fantastic that more people can be creative in the comforts of their own home or studio. Being a music and technology consultant and selling music as a service was a natural progression for me. I have cultivated this path alongside my musical career as a way to supplement the income I make from being a musician and composer. I find that the two go hand in hand—people that are fans of my music might hire me to help them with their own, and people that hire me for a music tech job might then hire me for production or violin work or go on tour with them. In this day and age and economic state, I think it’s important to hustle whatever talents you might have if you’re going to freelance. I’ve embraced the changing industry and will follow it wherever it goes because of my deep love for music and technology. More and more people are making music these days—why not help elevate the music and performances to a better quality? You’ve done so many other things, there’s a somewhat endless list of things to talk about, but just to pick one – has your work with Cirque du Soleil impacted your life as a solo musician? It seems like Cirque could really be a model for what a lot of us do – not that we’re necessarily going to be starting troupes all over the world and building permanent homes in Vegas and such, but in that they represent a kind of pinnacle of what live performance can be, for music alone. I learned a lot working with Cirque alongside dozens of individuals experienced in the art of putting shows like that together. I learned some extremely complex techniques in how to make Ableton Live do things it wasn’t designed to do. I also got a chance to help develop features for a cool Max/MSP program called MAT that is being used in Cirque’s KA show in Vegas and others. The developer Mike Atwood created the program as an interface for Musical Directors to work with during shows, which greatly simplifies the controllers and information. Recently I helped him put together a tutorial video on how to use MAT. Cirque definitely influenced my consulting career quite a bit, but as a musician and solo artist it lead me to dream a little bigger, to think more about the way video and lighting can sync up with my performances, to organize my sets better, to think more spatially and work with multi-channels, and incorporate more elements of theater, virtuosity and costume into what I do. What’s next? What are you working on now, as an artist or through Electronic Creatives, that we should look for? Well, recently I finished scoring a short film for Visa that should be online soon. I’ll be in San Francisco next week performing at a monthly electronic music event called Beat Church, debuting a new multi-channel show at The Compound—a performance space with an 16.8.2 horizontal and vertical sound diffusion system, and teaching live performance techniques. I’m working on some videos with Dubspot for their online school, finishing a sound library of original recorded sounds in Live’s Sampler format, working on a special DMX/MIDI synced lighting project for my next music video and plotting travels to perform and work around the globe.